Doorway on the east side of the Temple. bl.uk > Online Gallery Home	> Online exhibitions	> Asia, Pacific and Africa Collections	> Doorway on the east side of the Temple. An albumen print by Richard Banner Oakeley showing a doorway of the temple at Halebid in Karnataka. Halebid (ancient Dwarasamudra), a small town in the Hassan district, was once the capital of the Hoysala dynasty of the southern Deccan which flourished from about 1100-1350 AD. Invasions by the Delhi Sultanate in the 14th century led to its decline. The Hoysalas were avid temple builders and the site is renowned for the remnants of architecture and sculpture fashioned out of the chloritic schist in the region. The most famous monument here is the twelfth-century Hoysaleswara temple dedicated to Shiva, which was built for an official of Vishnuvardhana (reigned 1108-42). It is an exemplar of the lavish Hoysala style and is encrusted with continuous bands of sculpture, unsurpassed in its detail and vibrancy. The temple is two-shrined and built on a raised platform to a star-plan. 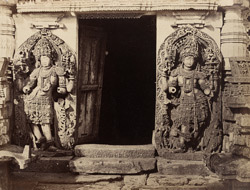 In this photograph we have a close view of the richly-costumed dwarapalas or guardian figures flanking the sanctuaries' doorways. Oakeley draws the reader's attention to the cobweb in upper corner of the doorway, presumably to indicate the detail captured on his waxed paper negatives.